Network's Thursday Coverage to Feature Inside the NBA Live from the NBA on TNT American Express Road Show at L.A. LIVE, Feb. 15, Beginning at 8 p.m.
NBA on TNT regular season NBA game coverage will continue with a Players Only doubleheader tomorrow, Tuesday, Feb. 13. 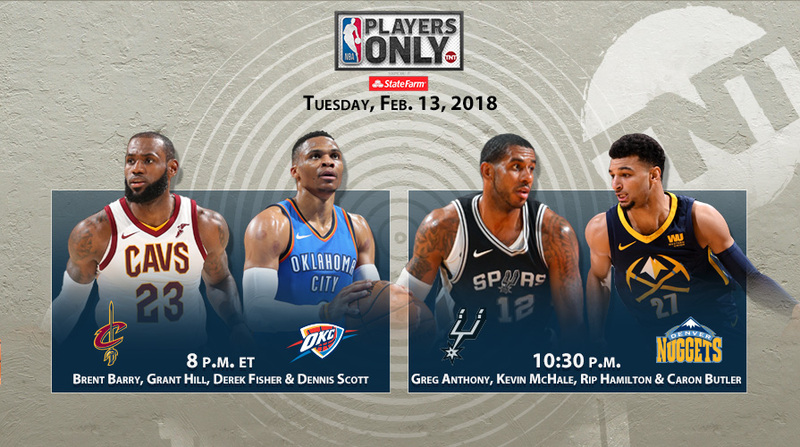 In the night's opening contest, former Kia NBA Most Valuable Players will meet when LeBron James and the new look Cleveland Cavaliers visit Russell Westbrook and the Oklahoma City Thunder at 8 p.m. ET. Brent Barry, Grant Hill, Derek Fisher and reporter Dennis Scott will be on the call from Oklahoma City. The night's second game will feature the San Antonio Spurs and All-Star LaMarcus Aldridge vs. the Denver Nuggets and Taco Bell Skills Challenge participant Jamal Murray at 10:30 p.m., with Greg Anthony, Kevin McHale, Rip Hamilton and reporter Caron Butler providing commentary. The Players Only studio team of Chris Webber, Shaquille O'Neal, Isiah Thomas and Baron Davis will provide pregame, halftime and postgame coverage throughout the night. The third weekly installment of Dre Days episodic features, starring Golden State's Andre Iguodala, will also air throughout the night on TNT and social media. On Thursday, Feb. 15, studio coverage throughout the night will be provided by Ernie Johnson, Charles Barkley, Kenny Smith and O'Neal from the NBA on TNT American Express Road Show, on site from L.A. LIVE. TNT's coverage begins at 8 p.m., with the Los Angeles Lakers and Brandon Ingram and Kyle Kuzma visiting the Minnesota Timberwolves and All-Stars Karl-Anthony Towns and Jimmy Butler at 9 p.m. Play-by-play announcer Kevin Harlan will be joined by analyst Greg Anthony and reporter David Aldridge for Lakers/Timberwolves. TNT's exclusive NBA All-Star 2018 coverage plans can be found by clicking here. • Dre Days - Golden State's Andre Iguodala stars in the weekly episodic franchise throughout Players Only coverage on Tuesdays, taking fans on a variety of experiences and adventures during off days in NBA cities. Iguodala will invite teammates and local friends to join him as he documents his experiences from the unique perspective of a current NBA player on the road. Segments will air on TNT's coverage and social media for nine weeks.